Publication Date: Today! Happy book birthday! Summary: In O'Connor's fourth installment of the Olympians graphic novel series starts with the journey into the Underworld after death but reveals itself to be about the myth of Persephone's abduction and the consequences that follow such. 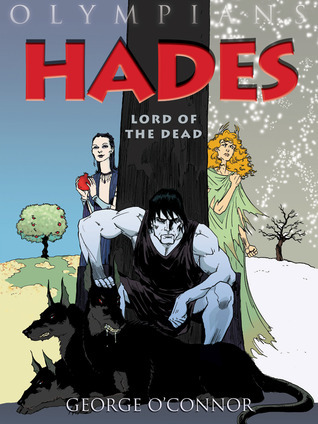 This graphic novel is not only about Hades, but about Demeter and Persephone as well. What I Think: Persephone's myth is one of my favorites. I love how clever the Greeks were to have such an elaborate tale to account for the seasons that we all experience. And saying that, this graphic novel is by far my favorite version of the story. I am such a fan of George O'Connor's style of art and his storytelling capabilities as I've loved the two other Olympian graphic novels that I've read and I love this one as well. The way that O'Connor takes the myth, stays true to it, but adds his own interpretation of aspects is what makes his graphic novels unique. For example, the thought that went into why he made Persephone a little dark in this story is so thought provoking. Also, as I've said in my reviews of Zeus and Athena, I love the G(r)eek notes, drawings, bibliography, recommended reading, discussion questions and author's notes at the end of all of his graphic novels- they make them accessible for not only children & teens, but teachers to use in their classroom. O'Connor also has an amazing website http://olympiansrule.com/ that has activities, information about the gods, and information for teachers. Writing Prompts: After reading a different myth, take the main events of the myth and create your very own comic strip.